ON MARS, it is polite to spit tomato seeds into the channels. When the flood comes, the seeds will float to the fields and give the next crop. Eating the seeds is very unwise. You will get a horrible stomach ache. The fever will be so high that you will ignite everything near you. Thus, you must be closed into a glass jar. This, of course, is not true. 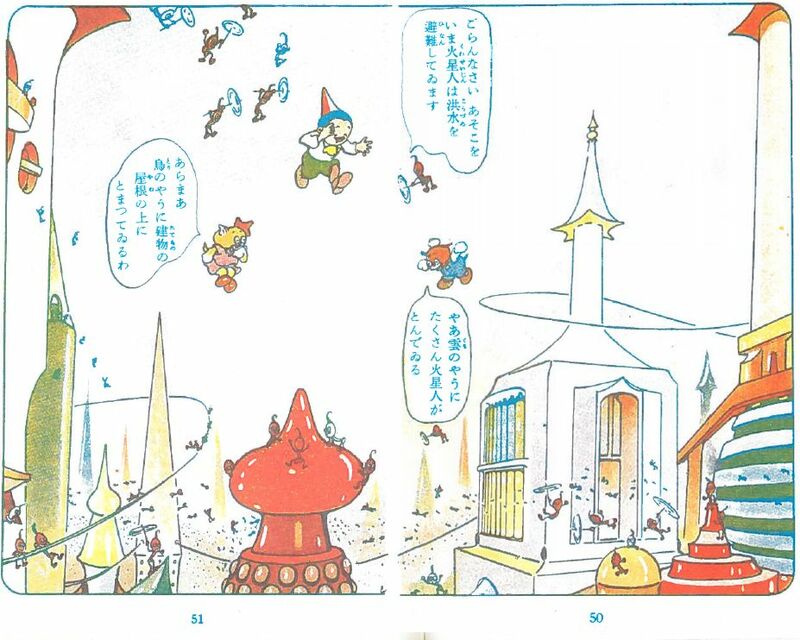 This is part of a brilliant dream scene from the manga Kasei tanken (火星探検, ”A Voyage to Mars”) by Noboru Oshiro (his real name is Rokuro Kurimoto, b. 1905, d. 1998) and Taro Asahi from the year 1940. I have written about this graphic novel before in my blog, but that was several years ago. As the old text is no more available, after a reread I decided to write something again. 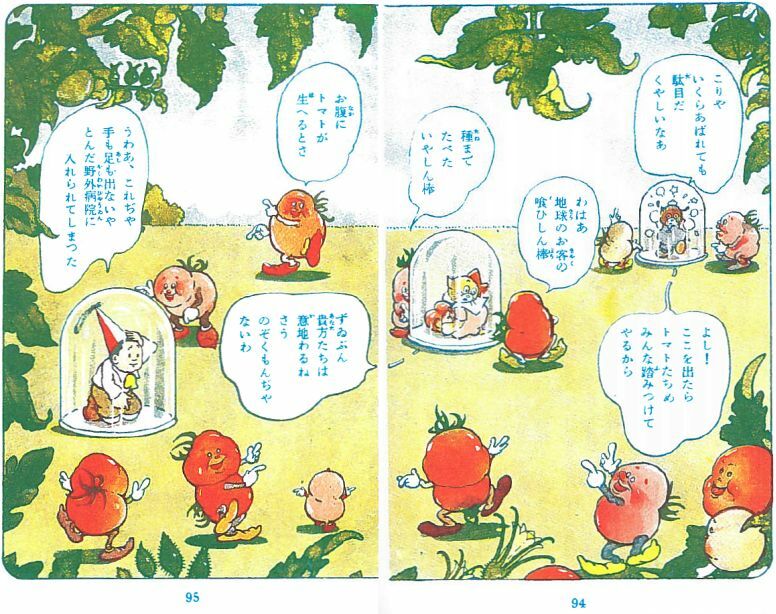 Kasei tanken was published in showa 15 (1940) by Nakamura Manga. It was a full-colour, hard-cover book of 160 pages. In 2005 Shogakukan published a well restored facsimile of the book, packed in a nice cardboard box. This is the version a happen to own. 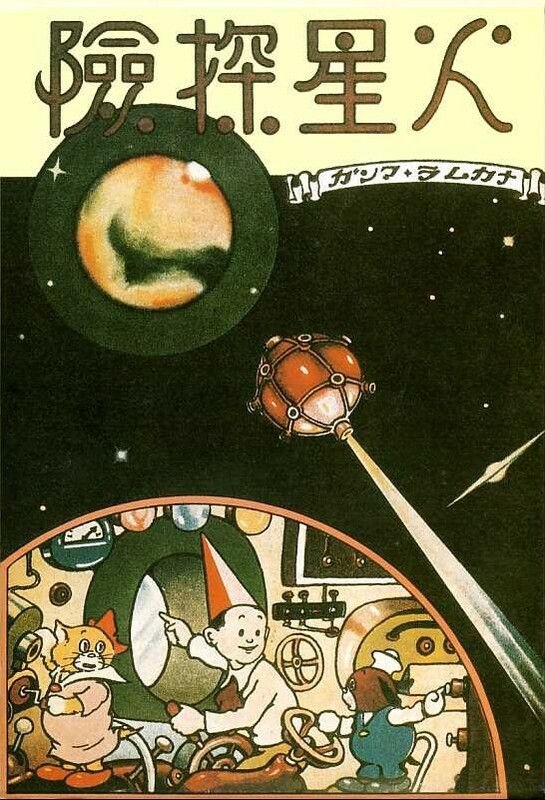 Noboru Oshiro is one of the ”second generation” of Japanese comic artists, who created adventures for children (and adults) starting in the 1930’s. The previous generation had produced more cartoons, not so much comics or graphic novels. Oshiro debuted in 1932. His contemporaries include Gajo Sakamoto (whose robot manga Tanku Tankuro was recently published in English), Suiho Tagawa (creator of the stray dog Norakuro) and Keizo Shimada (creator of the adventures of Dankichi). Eating tomato seeds can have catastrophic consequenses. THE STAR of Kasei tanken is a brave young boy called Tentaro. Wherever he goes, there will also go his cat Nyanko and his dog Pichi. As allways in childrens comics, the cat and dog can talk, and they dress in human clothes. This trio carries lunch to Tentaro’s father, dr. Hoshino, who works at an observatorium. There the father and his dear colleague, dr. Tsukino, show them the miracles of space research. They also hear about the longdrawn discussion about the so called canals of Mars. The following night Tentaro has a dream. He and his pets are somehow visiting the planet Mars. Even though Tentaro’s father has told differently, the canals are actually filled with water. Large Martian cities are bustling with tiny Martians. On Mars the trio has thrilling adventures. They fly away from a flood, they participate in a huge party and (after eating tomato seeds) they are taken to a hospital. Finally, they escape from Mars with a stolen spaceship. Luckily, Tentaro wakes up just before the ship crashes on Earth. Kasei tanken is quite comparable to the best western comics of the same era – such as Al Capp’s Li’l Abner, Hal Foster’s Prince Valiant or Hergé’s Tintin. It is gorgeous, well written and magnificently illustrated. In addition to being a fun adventure, Kasei tanken is useful. Tentaro learns for example, why there seem to be canals on Mars, and why a cat has whiskers. Oshiro proudly presents scientific equipment. Even outside the dream scene, the story slips slightly into science fiction: Dr. Hoshino häs an huge reseach chamber, where you can experience the atmosphere and gravity of Mars. Martians and their guests flee from flood. 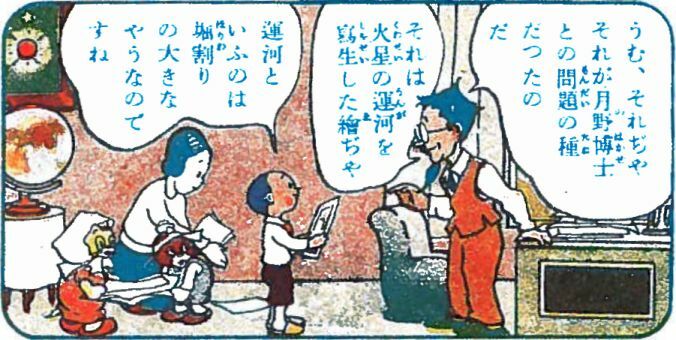 INVENTING story manga is useally credited to Osamu Tezuka. When I read Noboru Oshiro’s work, I notice that he might as well be called the father of story manga. If Kasei tanken, Kisha ryokou (”A Train Journey”, 1941) and Yukaina tekkousho (”The Happy Steelmill”, 1941) are not story manga, what is? Like the other two, Kasei tanken has a well written continuous plot. It is definitely not a comedy jumping from one scene to another. Oshiro also uses many of the effects that are currently considered characteristic to manga. 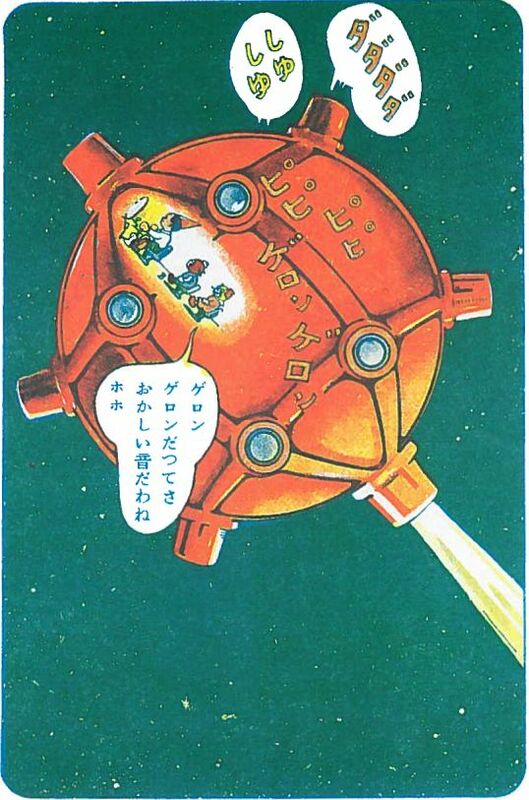 When the spaceship speeds towards Earth, it has a full repertoire of sound effects written in large katakana: dadadada, pipipipi, gerongeron, shushu. When the ship explodes, the ba-ban is enormous. The shape and size of panels live according to the needs of the story. You can also see some lines illustrating movement and speed. There are also obvious differences to modern manga: Kasei tanken is full-colour, and it has a lot of text. Oshiro’s drawing resemble the style of the Belgian Hergé (Georges Remi), who was a couple of years younger than Oshiro. The similarity is not as obvious in Kasei tanken as it is in Kisha ryokou. It is not probable that Hergé had an effect on Oshiro, or vice versa. I think both have taken inspiration from the same earlier artists. Such names as George McManus (Bringing Up Father) and Winsor McCay (Little Nemo) from early 1900’s come to mind. Though it must be said that Noboru Oshiro’s dream adventure is not quite as surrealistic as Nemo’s travels in Slumberland. The spaceship makes fine noices. ONE somewhat surprising fact about Kasei tanken is, that the story is not in the slightest imperialistic, patriotic or warlike. Japan was in war in 1940, and also much manga and animation was used for war propaganda. Noboru Oshiro’s works avoided this fate. Actually, you might say that Kasei tanken is slightly leftist. In Tentaro’s dream Mars is a class society: Martians with big heads are by nature leaders and scientists. Martians with small heads do the lowly labour. There is a reason for this: the writer ”Taro Asahi” is actually the famous leftwing poet and artist Hideo Oguma (1901-1940). He was born in Otaru, Hokkaido, and moved in 1929 to Tokio’s Ikebukuro, a poor area where many young artists gathered together. Oguma was strongly for tolerance and strongly against war. During the final years of his short life he worked as an advisor for Nakamura Manga. He died for pulmonary tuberculosis at the age of 39. In 1967, a memorial of his poetry was erected in Asahikawa, Hokkaido. The next year, a poetry prize carrying his name was established. A collection of Oguma’s poetry was published in 1989 by University of Michigan Press under the title Long, Long Autumn Nights. Several writings by Oguma are available in Japanese at Aozora bunko. Dr. Hoshino and his family. KASEI tanken can be even read as a small time trip to Japan seventy years ago. You will for example notice, that men already wear western clothes, but women are more traditional. In dr. Hoshino’s house, practically all furniture is already western style. There are some interesting points in the Japanese language as written in Kasei tanken. I don’t know Japanese well enough to tell for sure, which differences are due to dialect, which to changes of language. In Kasei tanken, two old hiragana-syllabograms are still widely used. After World War II, the characters ゐ (wi) and ゑ (we) where mostly replaced with い (i) and え (e). In Kasei tanken, いる (iru, “to be”) is sometimes written in its current form, sometimes as ゐる (wiru). The word ずいぶん (zuibun, “very”) is written ずゐぶん (zuwibun). The word え (e, “picture”) is ゑ (we). I think repetition characters are used more than is usual nowadays. With them, you can eg. laugh ヘヽヽヽ (hehehehe) or ホヽヽヽ (hohohoho). You can also write the word ときどき (tokidoki, “sometimes”) as とき followed by a kunojiten with dakuten. I cannot write it here, as kunojiten is so high that it can only be used when writing vertically. Many other words are written differently. For example, ありがとう (arigatou, “thank you”) is in it’s older form ありがたう (arigatau) and さようなら (sayounara, “good bye”) is written さやうなら (sayaunara). The word におい (nioi, “odour”) is written におひ (niohi) and びょういん (byouin, “hospital”) is written びやうゐん (byauwin). The name of the planet Mars, かせい (kasei), is in the older form くわせい (kuwasei).